Contains: Retaining ring pliers Internal 9 1/2" (Shaft/Bore Diameter: 2 7/16" - 4") & External 9 1/2" (Shaft/Bore Diameter: 1 1/2" - 3 11/32") and 2 Tip Sets (Straight, 15°, 45°, 90°). Converts from internal to external or vice versa, when pivot switch is moved to adjacent tapped hole. Fixed tips are precision formed and hardened for accurate fit and long wear. The 8 Long Nose Plier is ideal for work in tight spaces. The Long nose has a cross-hatched jaw for maximum gripping that wont slip. Channellock's laser hardening technology gives the cutting edge minimum wear for maximum life. A special electronic coating on the polished high carbon drop forged steel prevents rusting. Channellock Blue comfort grips give you maximum comfort. This Fixman Locking Plier Set is made to get the job done. Designed with a thumb screw adjustment knob and quick release lever. Constructed of carbon steel and nickel plated for rust resistance. Ideal to grip, loosen or tighten. Includes: 5 inch Curved Jaw Locking Pliers, 6.5 inch Long Nose Jaw Locking Pliers, 7 inch Curved Jaw Locking Pliers and 10 inch Curved Jaw Locking Pliers. Long Reach Pliers are designed with double joints so that the jaws can open a greater distance than the handles for improved access in tight spots. This 2-Pack Set comes with both Straight Jaw and Bent-Nose Pliers. They are manufactured from Alloy Steel that Resist Rust and Corrosion for Long Life and Durability. 2 Piece Heavy Duty Internal/External Retaining Ring Plier Set The retaining ring pliers in this 2 piece set convert from internal to external or vice versa, when pivot switch is moved to adjacent tapped hole. Fixed tips are precision formed and hardened for accurate fit and long wear. Large cushioned grips are engineered to reduce fatigue. 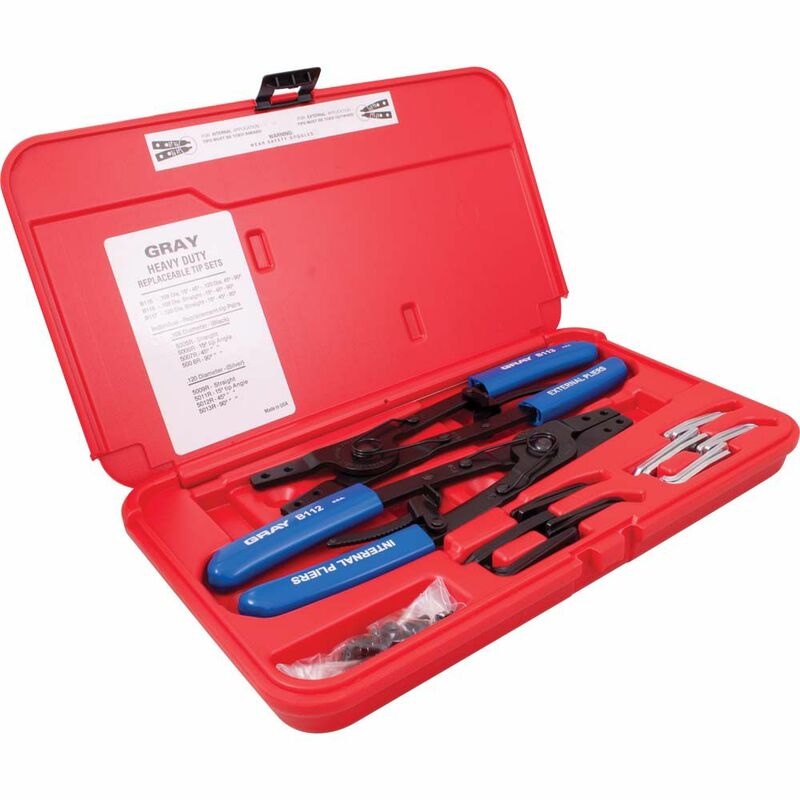 Made in USA and backed by Gray Tools worry-free lifetime warranty.